A Prison Songbook, the third songbook in the series, is the result of good fortune. When Belgium’s finest concert venue, Ancienne Belgique, approached us early 2009 to participate in their Alan Lomax tribute concert series, we felt the need to come up with an exceptional homage for an exceptional subject. 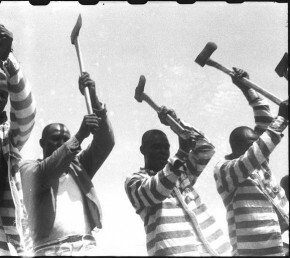 The idea was bold and challenging: we set out to rearrange historic prison work songs with a drummer and a male choir. The concert was intended to be unique: we would perform it once, in honor of Mr. Lomax. Prison Work Songs are sublime in form and content. They’re among the most powerful musical expressions of human emotion on the globe. To us and to many others interested in the Lomax legacy, the Parchman recordings of 1947-48 represent the holiest of holy. We spent roughly nine months crafting, practising, singing and working this extraordinary song material. We created songs intended for a general audience and modern ears, while we tried to preserve the haunting intensity of the originals. The concert of 10.10.09 was an extraordinary evening. In 2011 A Prison Songbook toured in a combo version. Backed up by drums and guitars, we rocked three mayor clubs [AB, Roma, Handelsbeurs] and had a cosy Theatre Tour with Roland playing Lead Belly. A Prison Songbook, the studio album with the glorious combo, was released in 2012.